Cinderella – 3.5/5 – Classic fairytales; they are the kind of stories that everyone knows. No matter how old you are, you know these fairytales. The classics always have specific characters, stories and the oblivious ‘happily ever after’ ending. Even if it is built on clichés, the classic fairytales always stand strong because of the warm feeling and strong message of ‘goodness’ within them. What we get here is Disney going back to their classics, and giving us a ‘revision’ of sorts in live-action form. With this retelling of Cinderella; we have a faithful compliment to a classic everyone knows from their childhood. Even for some of the movies obvious clichés and stretches of commonality; the heart of the story and its strong characterization and direction gives us a definite, memorable film. Premise: A classic fairytale brought to life; we get a live-action retelling of one girl who never gives up hope, and finds chance of happiness within a dashing stranger. The classic characters (known to many); are brought to the big screen in a vivid, alluring fashion. Being ‘live-action’; you are giving more attentive effort towards the actors/actresses involved. In doing so, you will have either great, layered characters or one-dimensional ones. For most of the main cast, they are endearing, poignant and most of all, enrapturing. The captivation comes from the ‘human’ aspect of the characters. You sense the level of strength in their flaws, even when it does come across as typical. Lily James and Richard Madden do an amaze job in their roles of Cinderella and the Prince. They break out of the typical ‘damsel’ and ‘prince charming’ molds, creating deeper and complex individuals. There emotional tenure is brought on by the fleshed out back stories, helping you ‘believe’ in their humble beginnings where you have raw strength in their personalities, as it ripples through the obvious tone of ‘falling in love’ at first sight. The strengths in each of them help pull you towards these individuals, as you pull for them to break their ‘trapped’ situations. Through their courage (a theme played throughout the film) you sense the fragility of their hearts being tested, but never failing. When it comes to the Stepmother; Cate Blanchett doesn’t cease to amaze as a cold hearted but intriguing individual. You see that she lays it on thick playing this ‘one-dimensional’ villainous archetype; but she does enough through her acting chops to add an allure of deceitful passion. You see reasons behind here decisions and treatment of Cinderella, even if you don’t agree with them. She is very commanding on screen, but in a very subtle way. This is a good thing because it never takes away from the main points/parts of the story, helping instead of breaking consistency. Out of the most impressive people, Helena Bonham Carter is the one who steals the show (even for the limited time she is on screen). As the Fairy Godmother, she is slick, humorous and charming. She knows how to layer the ‘happily’ with truth; showing clumsy with purpose. She bears a very whimsical mark on this film, which helps add to the ‘classic’ fairytale mantra. The step sisters are very much ‘aloof’ on screen, but their comical is welcomed, even if it’s one dimensional. The rest of the secondary cast helps added a lively feeling to the rest of the world. With names like Stellan Skarsgard, Hayley Atwell and Ben Chaplin, you have some note worthy individuals who bring ‘strong’ applicable characters that help flesh out the story, and provider depth to the main characters of the film. With adding these two elements, you give this ‘classic fairytale’ some more emotional power. There is strength in the fragile sense of the ‘overall’ Cinderella story, but this added bonus of these gives us something more humanly driven than in the animated feature. With the new back-story, we get to see what lead to Cinderella being under the care of her Stepmother. 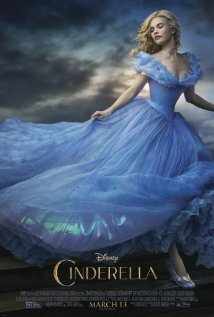 From here, the film weaves the story through its themes around Cinderella and her Stepmother, getting a very appealing tone towards staying true to the world, but allowing a ‘human tale’ come to life. That humanistic perspective is drawn from the themes of ‘courage, kindness and love’ wrapped around a direction of Shakespearean flavor. That is brought in by the strength of Branagh, who lets the ‘actors’ break some of the cliché stature with emotional overtures. This allows for ‘heartfelt’ moments to be strong and ‘evil’ situations to sting deeply. When the Prince finally meets Cinderella for the first time, we get the added layer of his back-story. Here, we get to see him trying to balance his heart with the kingdoms wishes. This dynamic is brought upon by the ‘father/son’ dynamic as well as ‘political’ wrangling from everyone involved with the monarchy. With this kind of ‘tug-a-war’; you delve deeper into the emotional side of what makes Cinderella and the Prince real on a human scale. You are brought upon their lives as if it was you in their roles, knowing that circumstance may or may not dictate outcome. Knowing the tale; you know where everything is headed. From here, the whimsical and ‘enchantment’ of the classic fairytale starts to bleed through, add raw dynamic and whimsical charm weave seamlessly. You feel the raw emotional power of the ‘one night’ that Cinderella has with the Prince at the ball, the ‘direness’ of her making it home before the last tick at midnight and not revealing the truth, and the inevitable outcome of her being found out by the Prince for that ‘happily ever after’ ending. The great thing about knowing how everything is going to happen, the director is able to add tone, dynamic and raw traits to the characters we have known since childhood. This allows the director to drown out the predictability, and lets the audience become enraptured by the heart of the story once more. The dynamic of the final act is a mixture of strong characterization, flawed human layers and truthful inspiration. There is a sense that if you ‘follow your heart’, circumstance doesn’t matter. Even if the cliché of a ‘happily ever after’ is a part of the epilogue, that feeling of being truthful, having courage and being kind is real to you and everyone. That is what makes this classic retelling stand higher than a typical fairytale, giving you something relative in that raw human presence. The cinematography of this film is completely breathtaking. From the ‘cinematic’ scope of the world to the endearing closeness found within the house, forest and castle, you get a real sense of the world these characters live in. Through the visuals being drawn out through this kind of scope, you get a feeling that is raw, real and genuine. The director helps bring feelings visually, allowing you to believe this fairytale as humanly possible. The score is mesmerizing; as you can feel the music compliment the important situations within the film. That ‘heart’ you feel is brought upon the mixture of the score combined with the acting and direction. The orchestra makes you sense a ‘grandeur’ aspect on a comparable relative scale. The irony is plush, but at the same time it is vivid. The music is very great; and does not detract from the film’s story and presence. Cinderella is what you expect it to be. It is a ‘live action’ retelling of the animated classic. Even so, it does enough to stand out because of the added ‘feeling’ and ‘worth’ from its actors/actresses, riveting score and overall cinematic/Shakespearean fusion added by the director. You are able to relive this tale and feel the humanity, even in its typical happily ever meaning. If you’re a fan of the classic and of Disney film; you will definitely enjoy this magical tale. This is a very good time for the family at the movie theaters. Get Hard – 2/5 – Movie Reviews by Ry!